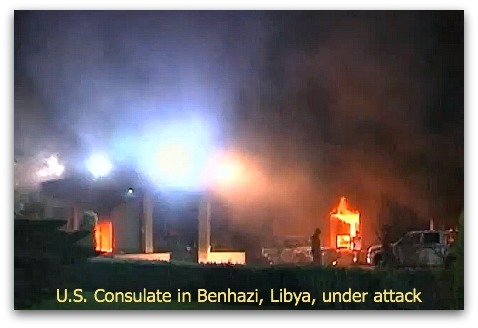 The deaths of American Ambassador Chris Stevens and three other Americans at the American Consulate in Benghazi, Libya, on September 11, 2012, were deeply disturbing. The American people were told (repeatedly, for weeks) by their president and his administration that these deaths were the tragic result of a spontaneous protest against an anti-Muslim video that escalated to uncontrollable violence. That was bad enough, if true. But what has come to light in the weeks since is unthinkable. The president and other members of his administration have been caught red-handed, lying about the Benghazi debacle, in a coverup that makes Watergate look like a walk in the park. That’s not really surprising, given this president’s history of saying whatever is convenient to his purposes at the time. What is shocking is what is being revealed about our president and his administration as this story unfolds. The Obama Administration was quick to blame an internet video for inciting the violence, even though they knew there was no protest in Benghazi. (Well, at least for once, he’s not blaming George Bush!) Administration officials repeatedly denounced the video, in an attempt to create a smoke screen to cover their own ineptitude or malfeasance. Now we’ve learned that the last several hours of the attack were watched in real time in the White House situation room. They knew there was no protest, yet continued to mislead the American people for weeks. At the same time, the President claimed to be sharing information with the public as it was received. The height of hypocrisy and deception. NOT the behavior expected by the American public of their President. It was becoming clear that what took place at the American Consulate on September 11 was a coordinated, planned, deliberate attack on American diplomats by 125 to 150 armed militants. And yet Obama refused to call it a terrorist attack. Fox News reported that there were several requests for additional security by Ambassador Stevens and his staff in the weeks prior to the attack, all of which were refused or ignored. Lt. Col. Andrew Wood, Army green beret in charge of security for U.S. diplomats in Libya and leader of a 16-man counter-terrorism unit, testified before Congress that his security team was returned home in mid-August as scheduled, despite their repeated requests to be extended due to circumstances on the ground, and despite the fact that there was no team there to replace them. Col. Woods appeared visibly upset as he testified that he felt security in Libya was inadequate, and that Ambassador Stevens was also concerned about security. A delay in his team’s return for just 30 days may have saved the Ambassador and three other Americans on September 11. And Wood indicated that an attack on the Americans was inevitable, as the US was the last foreign flag standing in Libya. Other countries, including Great Britain, had already closed their embassies or consulates and recalled their diplomats following earlier attacks. As it became clear that the government was being less than honest with the American people, numerous stories began to circulate about the events in Benghazi. Surely, the American President would not stoop to such levels and endanger the lives of American diplomats, just to manipulate the outcome of an election. Then the story got worse. The next story was that Obama’s plan was not to “rescue” Stevens, but to trade him for the Blind Sheik in a prisoner exchange to appease radical Muslims. Then the story took an interesting twist. Secretary of State Hillary Clinton appeared to throw herself under the bus, as she stepped up and took responsibility for the level of security at the Consulate. Then we heard speculation that this was a cleverly conceived move to give her the option to resign “with dignity” (and indignation) after the election, if Obama is re-elected. Then, she can spend the next four years distancing herself from Obama and his failed policies. She would appear to be the noble diplomat, falling on the sword to save her boss. That earns her some amount of respect for the noble gesture, despite her errors in judgment that led to the deaths of four Americans. Not at all out of line with some of the other political moves made by the Clintons. So, as we’re considering all these possibilities, incredulous that America’s “leadership” has descended to such depths, news reports started to trickle in that are so disturbing we just couldn’t sit idly by and say nothing any longer. Not surprisingly, Fox News seems to be at the forefront, pushing and probing to get the truth out to the American people. Catherine Herridge and Jennifer Griffin have filed numerous reports from the Pentagon, actually doing what Obama claims to be doing. That is, trying to find out who knew what and when and who did what, and passing the information to the American people as it becomes known. Obama and Biden claimed they didn’t know there were requests from the ambassador for additional security. Secretary of Defense Leon Panetta claimed that he and Chairman of the Joint Chiefs General Dempsey and the local area commander, General Ham at AFRICOM, all agreed they should not send additional troops yet, because they didn’t have a clear picture of what was happening on the ground. Then, as later reports came in, we heard the unthinkable. Apparently Obama, Biden and Panetta, along with other members of the Administration, watched events in Benghazi unfold in real time via video feeds in the WH Situation Room. They could see how desperate the situation was at the Consulate, and they did nothing! Former Navy SEALS Tyrone Woods and Glenn Doherty, in the CIA annex a mile away, heard shots being fired at the Consulate and requested permission to go and do what they could to help. Unbelievably, they were told to stand down. Not once, but twice. “From Day One in training through graduation and beyond, neophyte SEALs are conditioned to consider themselves parts of a team. ‘No man left behind’ is axiomatic,” said Retired U.S. Navy Captain Larry Bailey, SEAL, who was once in charge of SEAL training in Coronado, California, and is now a leading member of Special Operations Speaks. Woods and Doherty, following principles ingrained in them during military service, decided to ignore their orders to stand down, and proceeded to the Consulate to render aid. Then things became a little chaotic. “It gets worse. A third request for back-up was also denied when Americans were taking fire at the CIA safe house, or annex. The request was denied. There were no communications problems at the annex, according to those present at the compound. The team was in constant radio contact with their headquarters. “In fact, at least one member of the team was on the roof of the annex manning a heavy machine gun when mortars were fired at the CIA compound. The security officer had a [targeting] laser on the target that was firing and repeatedly requested back-up support from a Spectre gunship, which is commonly used by U.S. Special Operations forces to provide support to Special Operations teams on the ground involved in intense firefights. It was also reported that there was an unmanned drone overhead, perhaps providing video. Was it armed? No one seems to want to answer that question. If so, it may have served to turn the tide in the battle raging on the ground. And if not, why not? Was that just another reduction in security that the White House agreed to? The two Navy SEALs, Woods and Doherty, were still alive more than six hours into the battle, which lasted more than seven hours. Had backup been sent in when requested, it is very likely the two of them would still be alive today, and possibly also the Ambassador and Sean Smith as well. Woods’ father, attorney Charles Woods, said on Fox News that at the ceremony at Dover AFB, when the four bodies returned home, Obama wouldn’t look him in the eye, kept looking over his shoulder, and shook hands like a cold fish. Now we know why. He also says he knew Hillary was lying when she started talking about the video again. Now Woods is demanding answers about what really happened. And in an unbelievable display of crassness, at the ceremony, Joe Biden loudly blurted out to Charles Woods, “Did your son always have balls the size of cue balls?”What an utterly inappropriate and disrespectful remark to make to a father who has just received his son’s remains in a flag-draped casket. This whole Administration seems to be clueless and classless. Ambassador Stevens apparently died of smoke inhalation, lending some credence to the botched kidnap theory. Otherwise, why didn’t the attackers just blow the place up and kill him outright? Reports are that there were roughly 125-150 Islamist militants. They clearly had the advantage, and could have killed him if that was their goal. It appears more likely that they wanted him alive. Then they would have “leverage” to negotiate for the release of the blind sheik. General Ham and Admiral Gaouette Relieved - Related? Remember General Carter Ham, whom Defense Secretary Leon Panetta said agreed with him and CJCS General Dempsey that it would be foolish to send in additional troops without having a better idea of what was happening? But wait, didn't the President say he told the military to do whatever was necessary to preserve American lives? Incredulous, Ham reportedly said basically, “Screw it. We’re going in anyway.” We have heard that within about a minute of that decision, Ham was “apprehended” by the next senior officer and notified he was relieved of command. Panetta has since claimed that Ham's relief was a “normal rotation” and unaffected by events in Libya. What an interesting coincidence. In addition to Ham, Obama ordered the immediate removal of Rear Admiral Charles M. Gaouette, USN, Commander of Carrier Strike Group Three (CSG-3). The USS John C. Stennis (CVN-74) is his flagship. News reports indicate that Admiral Gaouette was relieved for "allegations of inappropriate leadership judgment" and it had nothing to do with personal actions. Again, scuttlebutt says Gaouette was fired because he disobeyed orders on September 11 and ordered his forces to "assist and provide intelligence for" the American forces ordered into action by General Ham to aid in the rescue of Americans under attack at the U.S. Consulate in Benghazi. I suppose only time will tell. Update: General Martin Dempsey, CJCS, says Gaouette's relief was unrelated to Libya. But the investigation into the allegations that led to his relief will likely not be concluded before the end of the year. Perhaps we'll hear the truth some day. I know a number of retired senior officers who are hoping that either General Ham or Admiral Gaouette (or both) will resign under protest, and make the truth known. Arnold Ahlert, writing in Canada Free Press, says, “In tennis, the expression is 'game, set, match.' Bottom line: unless Americans are willing to completely ignore the reality that this administration completely abandoned the time-honored military concept of never leaving our dead, wounded — or those still alive — behind, this election is over. "It is a fitting end for an administration utterly bereft of honor and integrity, when honor and integrity interfere with political expediency. “This is way bigger than Watergate," he continued. "The only difference is that, this time, a corrupt administration is being protected by an equally corrupt media, completely determined to drag their anointed candidate across the election finish line before this scandal explodes. Such a despicable alliance is the stuff of totalitarian regimes. For a more detailed roundup of the events, with links to original sources, see Attack on the U.S. diplomatic mission in Benghazi. Your Thoughts on the Benghazi Coverup? The American Ambassador to Libya was murdered in a deliberate attack by armed militants. What do you think about the U.S.government's response, ordering special operators to stand down rather than trying to help? And then being caught in bald-faced lies about what happened? Do you have special experience in intelligence, special operations, or diplomatic postings that gives you a special perspective on these events? Your submission constitutes your agreement to the published submission guidelines. Skip Down to Read Other Comments. Your comments will appear on a Web page exactly the way you enter them here. (Unless we edit them for space, because some of your content is in violation of the submission guidelines, or some other reason, or delete the entire post as being somehow non-responsive.) We reserve the right to edit in our sole discretion. TIP: Since most people scan Web pages, be sure to include your best thoughts in your first paragraph. The first couple of lines is what people will see as your page description, and will determine whether the click to read the rest. Do you have a picture to add? Great! Click the button and find it on your computer. Then select it, and write a short caption telling us who or what is in the picture. These must be photos you have taken or that you own the rights to, such as a license from a stock photo agency.